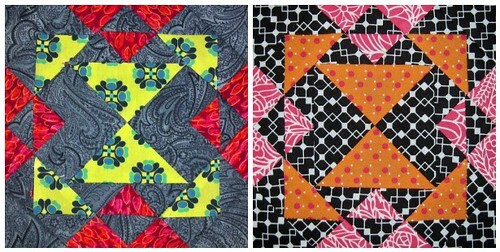 In a marathon of paper-piecing, I completed the last three replacement blocks for the Farmer’s Wife Sampler! I can’t decide which of these Corn and Beans blocks I prefer, honestly. 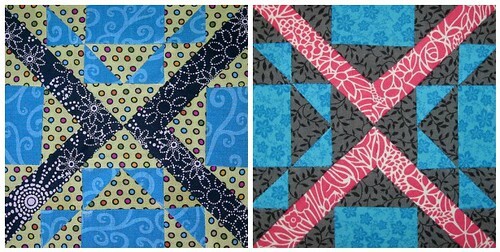 I love the fabrics in both of them, and would have kept the first iteration for inclusion in the sampler. Unfortunately, I forgot to turn off the ‘fit to paper’ sizing and the block came out 1/2″ too small. The second version came together much easier than the first version – I stared enough at the block to realize that the default paper-piecing groups were actually pretty awkward and counter-intuitive, so I re-grouped the piecing before printing. I actually prefer the first version of Flower Garden Path – I much prefer the background fabric. That said, I kind of adore the way the black and white fabrics work together. My improved piecing skills show in the second version, at least to my eyes. You probably can’t really tell from the photo, but there’s a lot less of a wave to the block and the seams lie a lot better. My points are a lot sharper too, this time around. Yesterday, I was pretty sure that I loved the first version of Garden Path much better, but now that I look at it, I’m actually digging the second block. It feels more effective with the gray as the background print. Plus, the pink fabric is super cute 😉 It’s a Dear Stella, print, by the way. 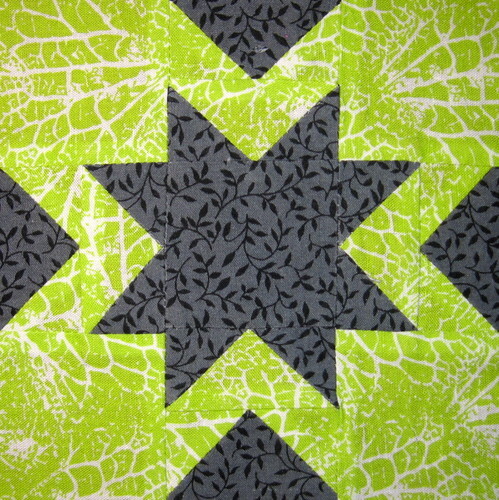 And then to wrap things up, I made this Eight Pointed Star block from 1001 Patchwork Design by Maggie Malone. This block will be replacing #037 Flower Pot. I seriously dislike Flower Pot – it’s such a heavily weighted block, in so far as balance and design go. Of course, I do have a distinct preference for my blocks to be bilaterally symmetrical. Now, I can focus on completing the top itself – much easier now that the last of the fabrics I needed for the setting have arrived. I’m thinking I might push through to try and finish that today, since I’m home. (I took the day off for a much needed eye exam.) However, to do that, I really, really need to pick up a small rolling chair for the sewing desk. My body was very not happy with me after I finished those three blocks yesterday, sitting in the dining chair. Anyway, I’m off for now! Time to go get cleaned up. I’m curious. 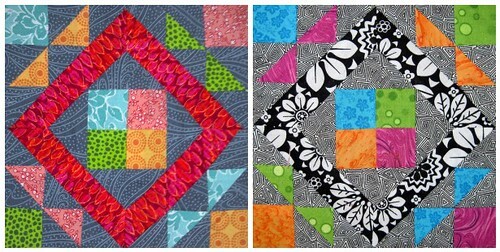 How many blocks in the quilt and how many did you redo? The first class I did for a beginners quilt has nine different star blocks in it. Everyday after the class, I would remake the previous evening’s effort in other fabric and then do my homework, as well as a second version of it. In the end, I had two quilt tops, both very different. The class quilt was lovely and neutral for my son and his wife, the second one was very cheerful in brights and went to a family friend for a birthday gift. I must confess to really liking the bright remakes as they are just so cheery. I think I’ve remade a total of perhaps 18 to 24 blocks. Enough to put together a small top, but due to the problems inherent in some of them (incorrect sizing, poor fabric choices), I choose to just get rid of them. I do like the of making two sets of blocks, and I have to confess that I’m kind debating doing the same with the Dear Jane blocks. I just don’t know that I have the patience to do so.